The Vector Modular Staircase is a clever design with a central interlocking spine which can provide a straight, L-shaped or U-shaped winder staircase, and open treads. 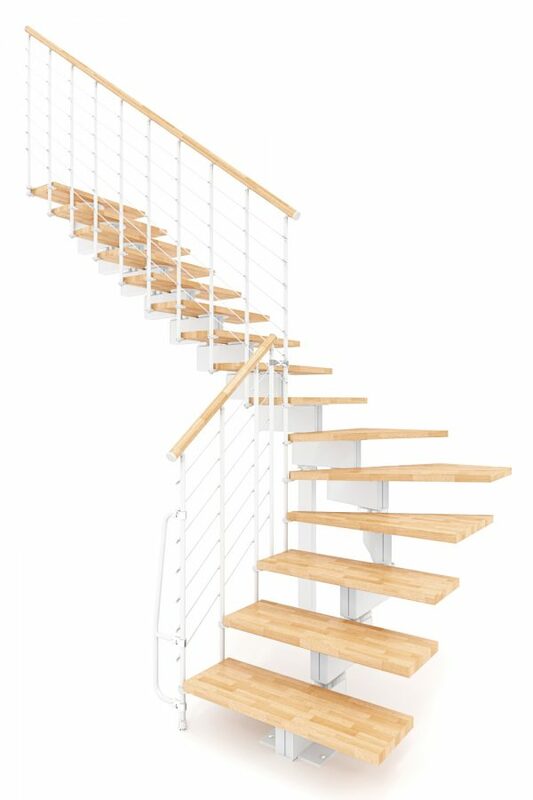 The powder coated steel posts support stainless steel cable for the balustrade design, and with solid beech treads and beautifully designed sleek central spine, the Vector staircase is extremely robust and practical. 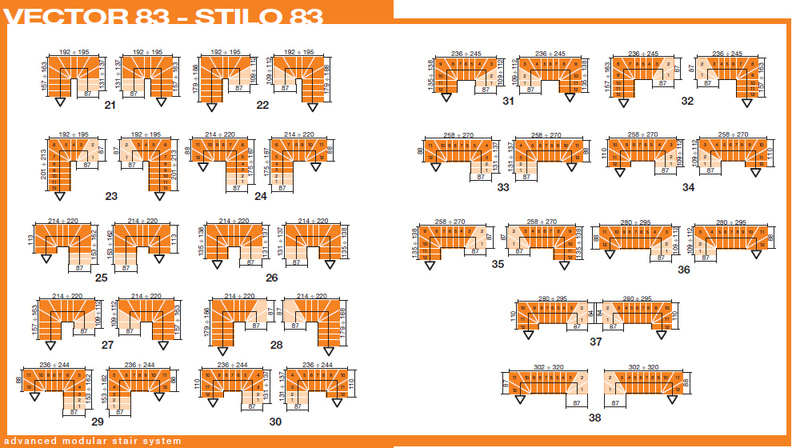 The Vector is available in two widths: 700mm and 830mm to suit your project. 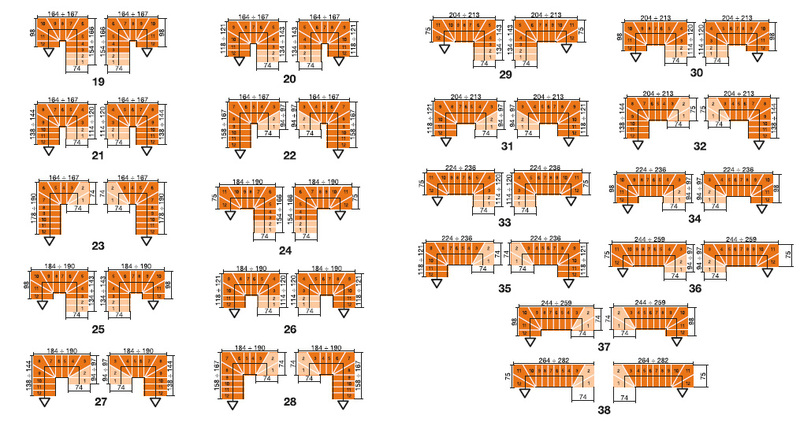 Please select the width, shape and the colour options from the drop down boxes below. 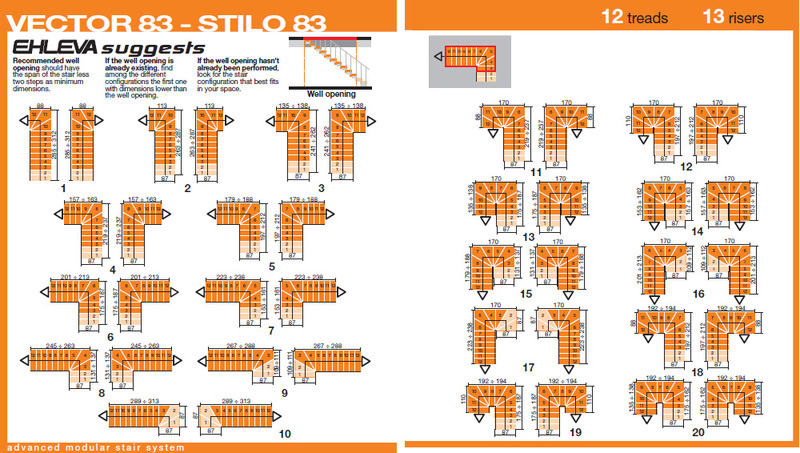 Click here for details of how to work out any Vector components you may need for your project – extra treads, external railing or additional staircase balustrading etc. Delivery timescales are approx 10-15 working days. 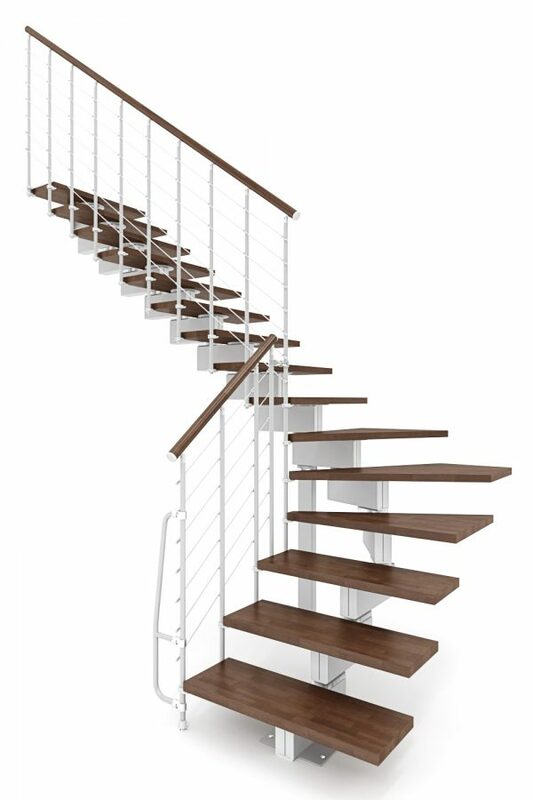 A full range of accessories is available – balustrading for the stairwell, riserbars, external balustrade for the open side of the staircase, additional treads etc. Download the Vector Instructions HERE. 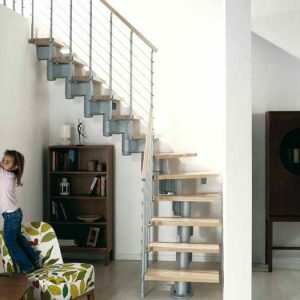 The Vector Modular Staircase is designed to have a shadow gap of up to 60mm between the staircase and the adjoining wall. 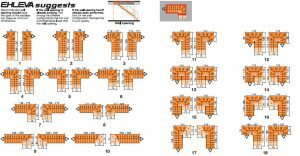 For higher floor to floor heights, use additional tread kits and components as shown on the Accessories pages and you can double check this with our handy Vector Components Sheet HERE. 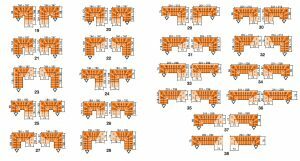 *By adding one or two quarter turns in any position in the staircase, this provides 76 different configurations. 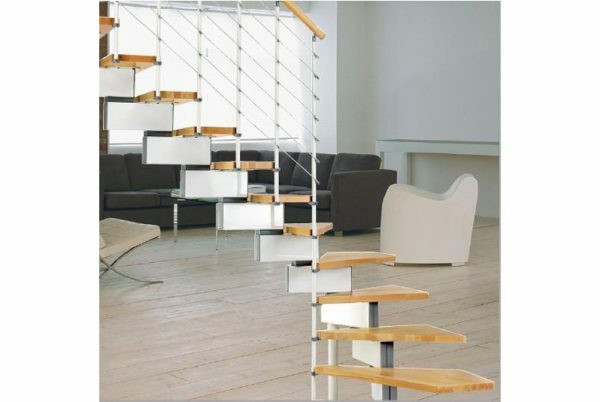 *The configurations available on the Vector Modular Staircase are designed to satisfy most European regulations. However, please check with your local Building Control that your chosen configuration is acceptable to them. 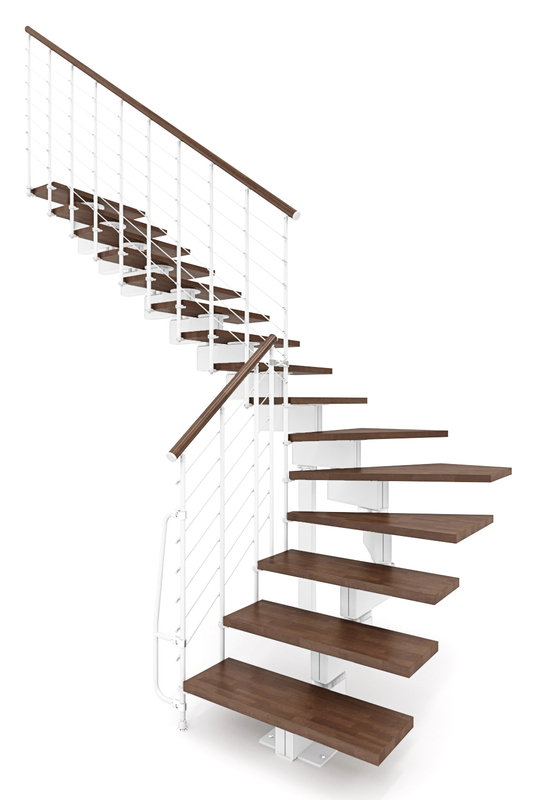 The balustrading on the Vector Modular Stair Kit might not be acceptable to your local Building Control Department and we always recommend that you discuss your project with them before you commit to purchase. 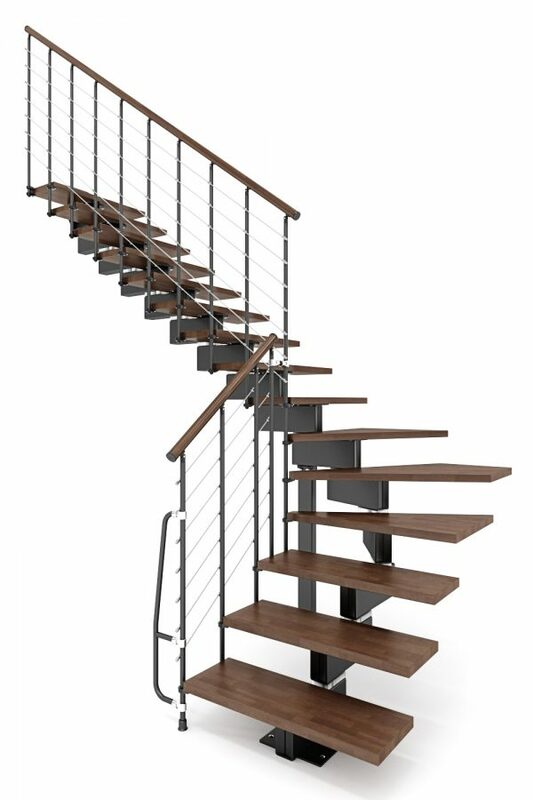 Please note that the Vector Modular staircase is made in Italy and some of the suggested configurations may be outside of the UK Building Regulations. If you have any queries on this, please do not hesitate to contact us for advice. 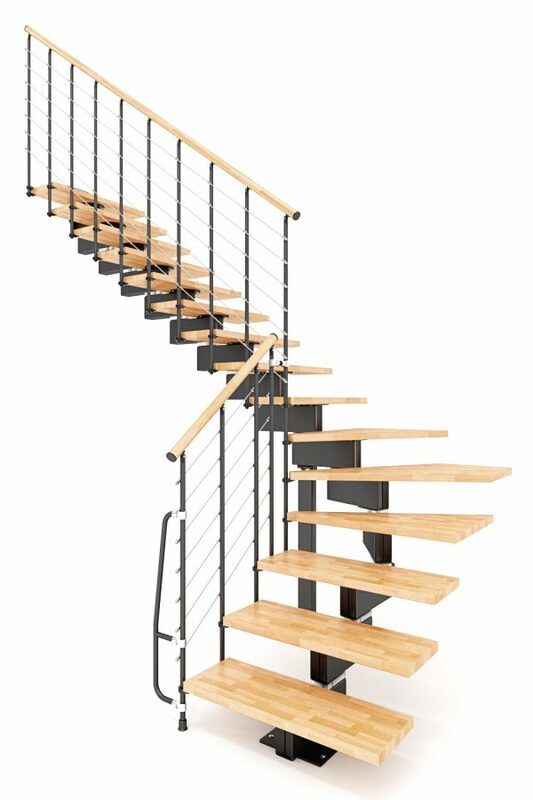 The Vector Modular Staircase kit can be installed with a clockwise or anti-clockwise turn using the quarter turn set/s of treads. You decide when you fit the staircase! 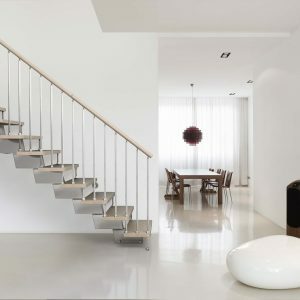 Generally, it is best to form the opening for the staircase at least as big as the staircase layout itself. 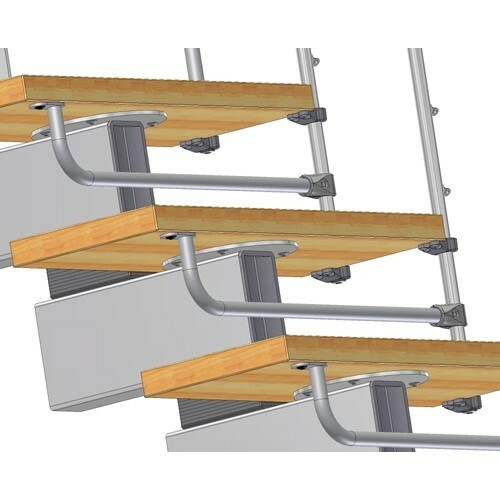 The standard kit has 13 risers (12 treads) and the tread rise is adjustable from 180mm to 235mm, although UK regulations have a maximum tread rise of 220mm. 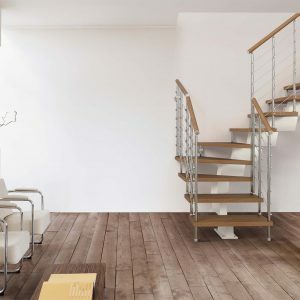 This means that the standard kit will suit floor to floor heights of up to 3025mm (or 2860mm to comply with UK Building Regulations for maximum tread rise). If your floor to floor height is higher than this, you simply need to add additional tread kits as required. If your floor to floor height is lower than this, you use less treads. 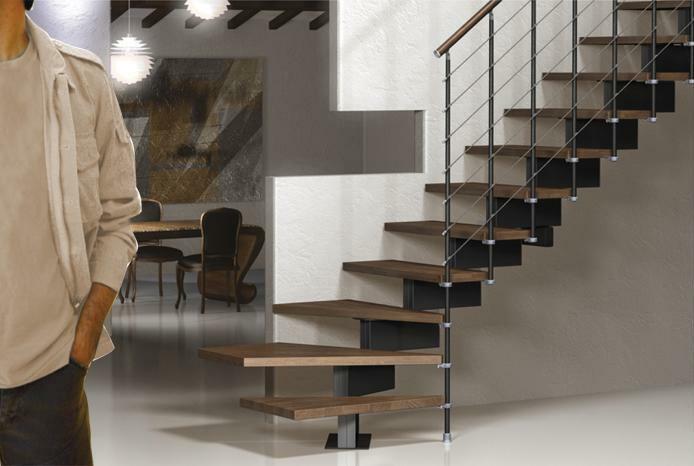 The individual tread rise and going is achieved by adjusting the central tread support modules to provide your overall correct staircase height. These are supplied in the kit, together with all fixings and fittings required plus clear installation instructions and an installation DVD! 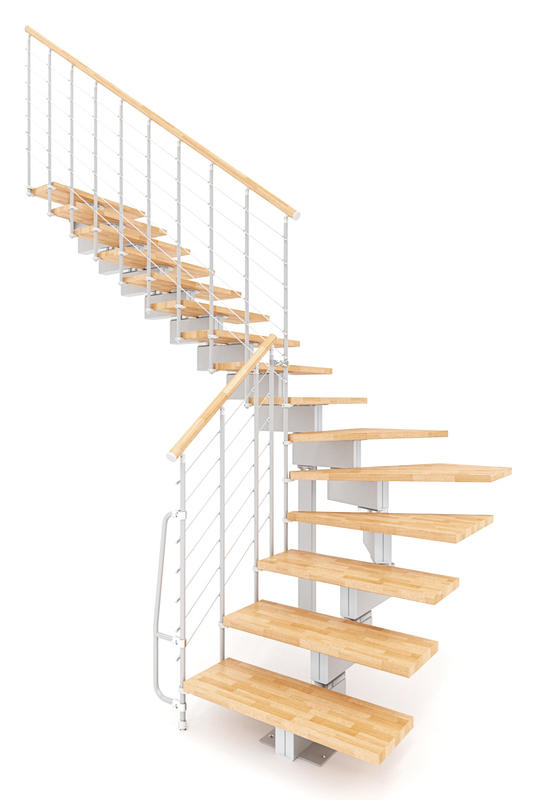 The going or depth of the treads is adjustable on the Vector staircase from 200mm to 230mm (for the 700mm wide version) and from 220mm to 250mm for the 830mm wide version – but the UK Building Regulations require a minimum tread going of 220mm and your chosen configuration should bear this in mind. 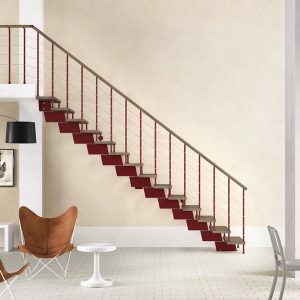 Powder coated steel riserbars are available as an accessory kit to fit between the open treads to satisfy the requirement for the gap to be less than 100mm. 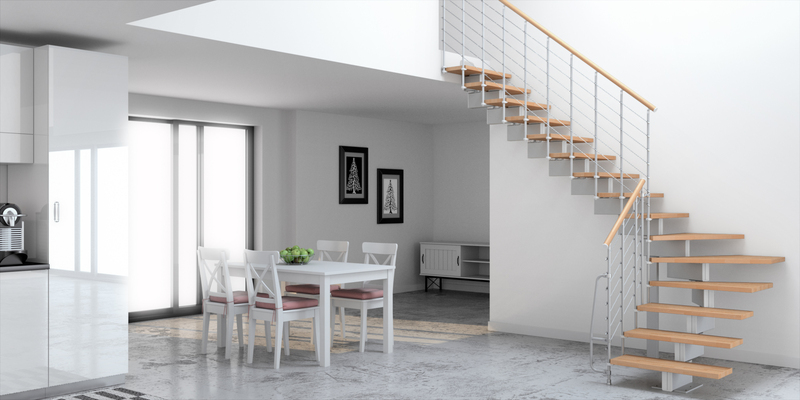 Click here for details of how to work out any Vector components you may need for your project – extra treads or additional staircase balustrading etc. 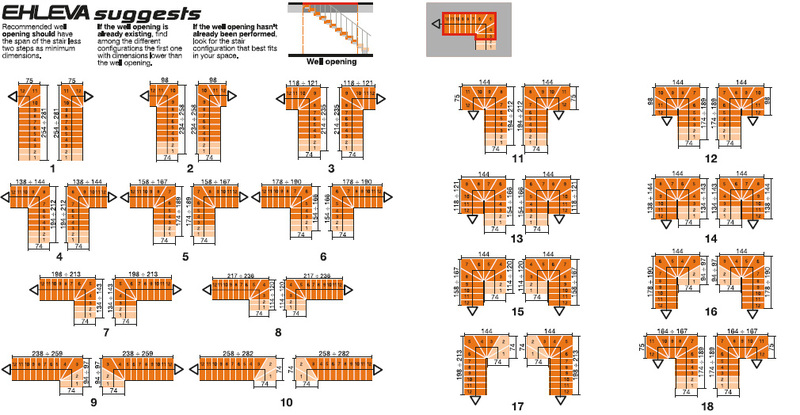 Vector70 Layout Configurations – Click for larger image. 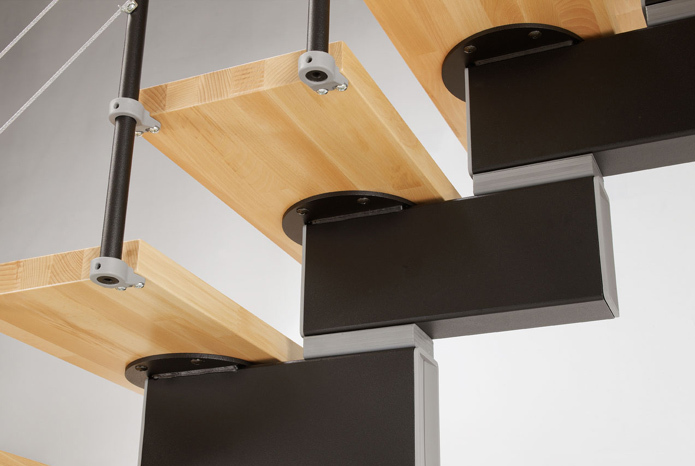 The clever modular design of the Vector allows you to drop the 3 treads, which form the quarter turn, anywhere in the run of the staircase offering an amazing 76 different configurations for each width of staircase. 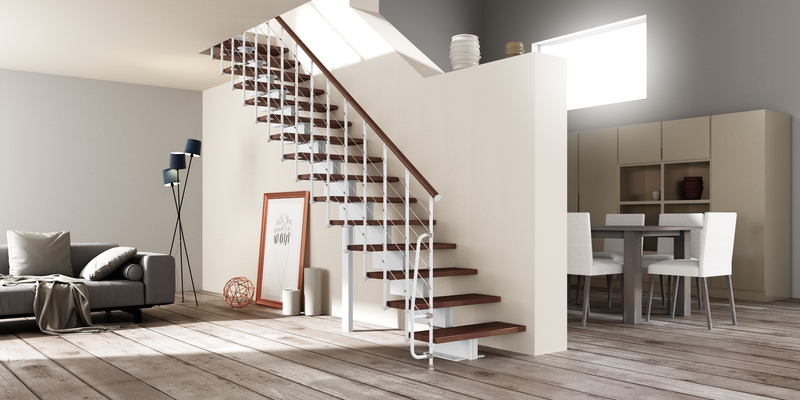 Open the online Ehleva brochure below and scroll through the pages until you reach the Open Staircases section for more details of the Vector modular stair kit. If you need any further help, just give us a call.